Universal microphone shock-mount suitable for microphones weighing up to 400g in weight (750g vertical only) & between 18mm and 55mm in diameter. The G-USM-L is a Sound-Link / Microtech Gefell special. It is based on the Rycote USM-L mount and sells for about the same price. 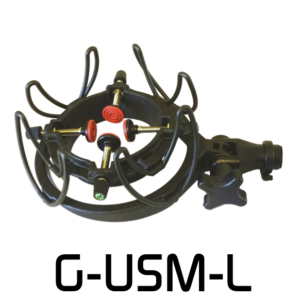 The main differences are the green Gefell logo on the adjusters and the black “Lyre” suspensions (instead of the red Rycote ones) – the microphone pads are red to clearly differentiate the G-USM-L from the G-USM .